This strip is a reply to Sky tutorial, begginers stare in awe. no one tell the secret!, Tutorial: Star-ish background!, SG for DUMMIES Contest!, Neptune Portrait! Select them all and group them. Shrink the size of this group and duplicate it in the area you want to fill with stars. Rotate the groups as you go for a more random effect. Tip - You can repeatedly select all, then un-group and group again to make a larger grouped set. 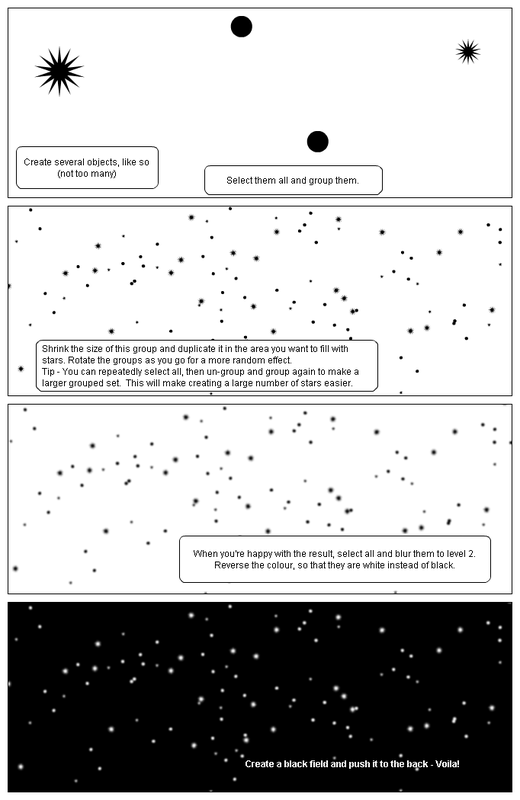 This will make creating a large number of stars easier. When you're happy with the result, select all and blur them to level 2. Reverse the colour, so that they are white instead of black. Create a black field and push it to the back - Voila! Starry Night ! :) Awesome ! cool i will use that! Great tutorial... will be using that! This is a grrreat tutorial!! Silly me...I can't believe I didn't fave this. Done! Nice!! I hadn´t thought of grouping several stars... that´s smart!